Welcome to the Panasonic Technical Forum! The Forum is designed to connect you directly to our product engineers for easy access to technical information relating to Panasonic Wireless Connectivity products. Join the conversation and network with a community of technical engineers today! Click here to sign up. Stay connected! Simply ask a question or join an existing discussion in one of our forums below to receive the latest technical information when it comes to Panasonic Wireless Connectivity. Have a general question of wireless connectivity? Browse the General Topics forum today. Browse the Bluetooth forums to get the latest technical information and tips about Classic, SMART-Ready and SMART modules. 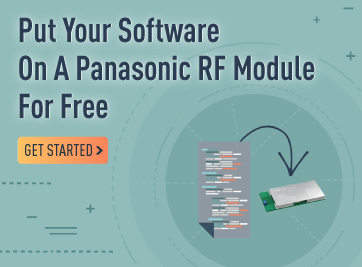 Have a question about Panasonic’s Wi-Fi Radio Modules? Connect with or product experts today! Topics include technical information, tips, applications, specs and more. Explore discussions between industry specialists and ask our product experts about Mesh Networking. To view Panasonic’s Forum Guidelines click here. To view Panasonic’s Term and Conditions click here.